LCMS Grade HFBA Amps - CovaChem, LLC. CovaChem's LCMS Heptafluorbutyric acid is well suited as a chromatography additive for use in HPLC and LCMS applications. 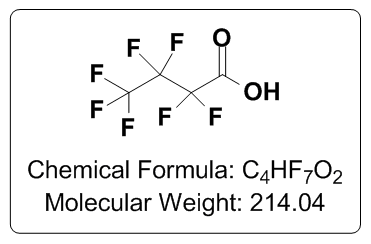 Heptafluorobutyric acid (HFBA) is typically beneficial as a separations enhancer, and is a moderately strong ion pairing agent, which can be a very effective way of gaining good analyte separation and sharp peaks in HPLC applications. This moderately strong ion pairing effect can unfortunately reduce ionization efficiencies (compared to other acid additives, such as Formic acid (11202) and Acetic acid (11201). This reduction of ionization efficiency can often be overcome by the incorporation of the post-column addition a “TFA fix” reagent, such as a highly refined (2-(2-methoxyethoxy) ethanol (CovaChem 11207) or LCMS Grade Propionic acid (CovaChem 11207). Please feel free to contact our technical support for more information on this subject. CovaChem's LCMS Grade HFBA comes in two convenient package sizes (10 x 1 mL Ampules and 25 mL bottles). The 1 mL Ampules of LCMS Grade HFBA are useful for quickly preparing 1 Liter bottles of 0.1% HFBA solutions in either water or other organic solvents.